THIS form of treatment for the once labelled insane was a form of neurosurgery, pioneered by Portuguese neurologists in 1935. American Horror Story: ASYLUM includes this major part of early psychiatry in episode 6, where prisoner, sorry, patient Anne Frank is returned once again to Briarcliffe having attempted to suffocate her son in what Dr Thredson diagnoses as postpartum psychosis (post-natal depression to us nowadays). The toe-curling scene where Arden uses a crude instrument, much like an ice pick, to delve under her eyelids and into her brain is not an exaggeration, in fact, is quite the realistic portrayal of what neurologists back in the mid 1930s were doing to patients. And I’ve got all the gory, but scientifically sound, deets for you. This particular operation was designed on the basis that various forms of mental illness could be treated and in fact cured by altering the actual way the brain works. Specialists believed that by severing the connections between the frontal lobes (prefrontal cortex) and the rest of the brain, you could control and stabilise emotions and behaviour, without risking any harm to their IQ and intelligence or motor skills. In a little more scientific details if you’re interested, the prefrontal cortex control what is often referred to as executive functions. These control things such as personality expression, socially acceptable behaviour and reasoning and understanding. Well, it’s actually quite gross and intrusive, but what brain surgery isn’t? Dr Antonio Moniz and Dr Almeida Lima began performing prefrontal lobotomies by drilling holes in the side of a patients skull, into said prefrontal cortex’s. By then injecting alcohol (which one I couldn’t find) into the white matter (which carries messages to the grey matter), it then severed them, and destroying them. This, however, often resulted in damage to more than just the prefrontal white matter, and causing more problems, as you can imagine, than they started with. But I thought this blog was about TRANSORBITAL lobotomies? Well, it is. Neurologist Dr Walter Freeman, just a year later in 1936, began performing these procedures in America, with partner Dr James Watts. He wanted to find alternatives (cheaper, more accessible and quicker) to those started by Moniz & Lima, because they required patients to go under general anaesthesia, and this was time-consuming and pricey. Instead, he opted for a simple elctroconvulsive shock to knock patients unconscious. 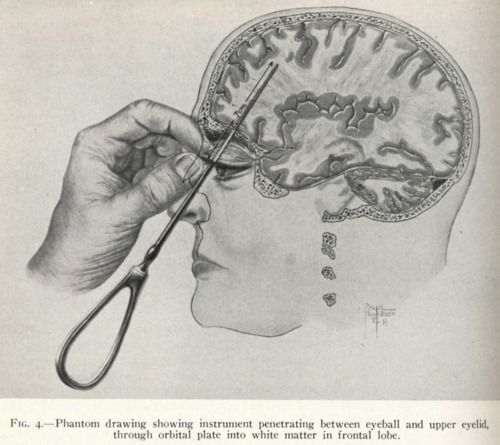 He knew of an Italian doctor (Dr Amarro Fiamberti) who had performed brain surgery by inserting equipment through the eye, and so having practised on many cadavers with an ICE PICK (yep, an ice pick), Freeman developed the now transorbital lobotomy. By lifting the eyelid, and breaking through the thin layer of bone, he could reach the prefrontal cortex, literally wiggle the crude instrument (orbitoclast) to damage the white matter aforementioned. Yes, although patients were left with a pair of black eyes, to which Freeman prescribed some….dark glasses! As he and Watts continued to perform lobotomies at a ferocious rate, to all ages (the youngest being 4! ), the media and society became accustomed and familiar to the ‘soul surgery’, as Freeman named it. He recommended it for the treatment of schizophrenia, depression, chronic pain, not to mention a myriad of other mental disorders. Results were varied. Some reported (many of whom were housewives like Anne…) a decrease in manic and psychotic behaviour, and simply resumed life before the onset of their psychoses, although it was reported that more than 100 of his patients passed away following traumas from the lobotomy, such as cerebral haemorrhage. Those who didn’t die though, weren’t guaranteed best results. Many were mentally damaged from the surgery and had their motor, language and general brain capacity damaged and/or ruined. Ouch. What happened to Dr Freeman? Well, he’d killed too many patients to be allowed to carry on, and so tragically for him, his medical rights were revoked in 1967. The mid-1950s had seen a decrease in widespread psychosurgery anywho, largely due to the introduction of chlorpromazine, a psychotic medicine.